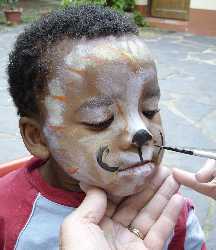 1) Please contact Face Painters directly via their contact details found on their directory listing pages. These you will find listed by countries in the Global Face Painters Directories Note: often email addresses have been written in the format "name(at)***.com" so that these listed email addresses don't get spam. Please edit the email address back to "@" Else the mail address won't work ! 2) For queries about products ordered online through our Face Paint Shop please contact the shop directly via the emails you will receive when ordering. If you send a comment from here it will be to this sites webmaster, who will have no details of shipments bought through the shop. 3) We now have a Page on FaceBook , so if you would like to follow our links and Posts click on the Facebook Button. 4) Face Artists with Directory Listings that need changes made, please send me the new text changes you require done from here and if you want photos changed this is possible too. When I reply you can send an email with any photos you need changed. 5) We have recently started Tweeting on Twitter so if you would like to follow the tweets, click on the Twitter button.